New version of LinkedIn app v2.1 is here for BlackBerry devices running OS v6.0 or higher. This update allows you to sync and merge your LinkedIn connections with existing BlackBerry contacts in your address book. And, with the new "Groups and More" tab, you can view saved and recommended jobs and access, add, view and participate in the groups that matter to you most. With the new Contact Sync feature, finding out detailed professional information about the colleagues in your next business meeting is as easy as looking them up in your address book. 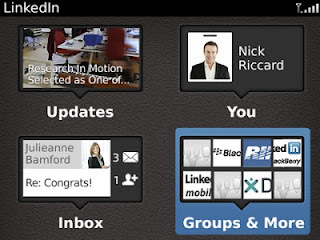 The app allows you to connect your existing BlackBerry contacts with your LinkedIn connections, and where no contact exists, the app can optionally create a new one for you. This helps to make keeping track of your business connections and interactions easier than ever.